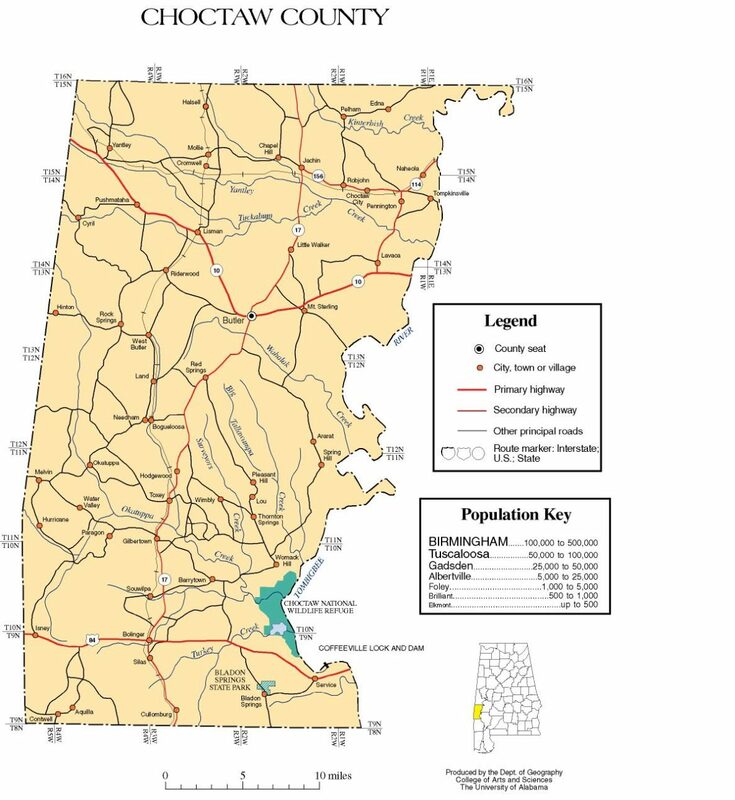 Choctaw County Alabama’s population is 13,859. Its county seat is Butler, Alabama. The county was established on December 29, 1847 and named for the Choctaw tribe of American Indians. Most of the early pioneers of Choctaw County were farmers from North and South Carolina. Choctaw County was created by an act of the Alabama State Legislature on December 29, 1847, from land formerly within the Choctaw Nation. Located in the southwestern part of the state, the county was named for the Choctaw Indians, some of whom had settlements near the present-day town of Pushmataha, named for the noted Choctaw chief. Early settlers in Choctaw County produced cotton and other agricultural goods that they floated down the Tombigbee River to Mobile. The forestry industry has been the economic backbone of the county since its creation in 1847. When Choctaw County was formed in 1847, Butler was created as the county seat. The town was located and settled in 1848. It is named in honor of Colonel Pierce Butler, a soldier killed in the Mexican–American War. If you are a visitor to our area, you have chosen a destination that has a wealth of heritage and cultural diversity. Our town is rich in community spirit with a strong sense of civic consciousness. Our residents benefit from a first-rate Volunteer Fire Department; a dedicated police force; modern utilities and communications amenities; and exemplary healthcare services ranging from the top-notch paramedics & EMTs of our ambulance service to the professional personnel of our new medical facility, Choctaw General Hospital. On behalf of the town council, the entire staff, and myself, we hope you will enjoy your visit to our website and we invite you to personally experience our lovely town and partake of our hospitality and attractions. Perhaps, you may even choose to live or invest here. The first permit to drill an oil well in Alabama, the A. R. Jackson Well No. 1, was granted to the Hunt Oil Company on January 2, 1944, near Gilbertown. Drilling started January 10, 1944, and struck in chalk of the Selma Group approximately one month later at a depth of 2,580 feet. Lisman was named after a 19th-century railroad investor at the time of construction of the nearby rail line. Needham is located near the center of Choctaw County. Silas is located in southern Choctaw County, in the southwest part of the state on the Alabama-Mississippi border. Silas was names for early settler Silas Shoemaker, who would become the first postmaster in 1890. Prior to 1880, only four families lived in the area; between them they ran a cotton gin, a sawmill, and a dry goods store. In 1911, the Alabama, Tennessee, and Northern Railroad built a line through the area, and the center of the town shifted closer to the railroad. U.S. Highway 84 runs east-west through Silas, and State Highway 17 runs north-south through town. Bladon Springs is an unincorporated community in Choctaw County. The community grew up around and gained its name from the mineral springs that once were operated as a renowned hotel and spa, now within the modern Bladon Springs State Park. The community itself featured many ornate homes and cottages built as summer residences by people from other parts of the state and elsewhere. Pushmataha is an unincorporated community in Choctaw County. It was named in honor of famed Choctaw chief Pushmataha. Much of the community is part of the Pushmataha Historic District, listed on the Alabama Register of Landmarks and Heritage.